Don’t miss out on the highly anticipated business event of the year, State of the City! This year’s theme, “Active. Innovative. Connected. 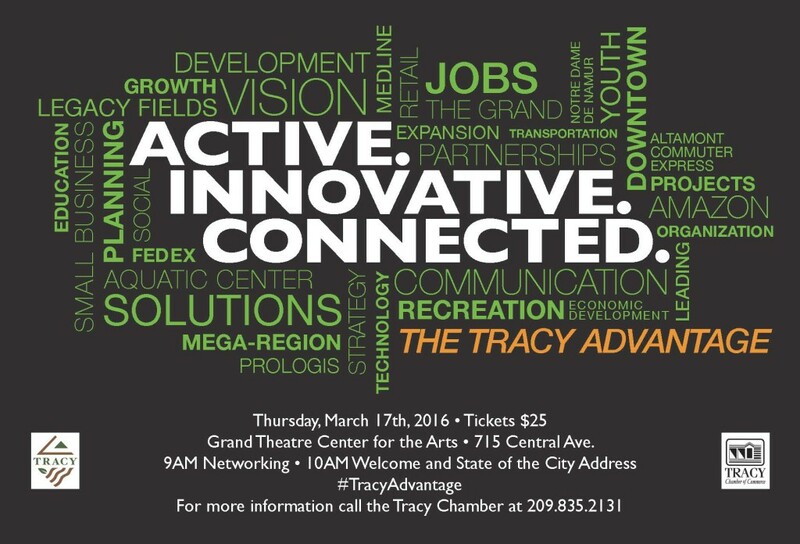 The Tracy Advantage,” reflects the City’s identity as a thriving socio-economic hub within the developing Northern California “Mega-Region,” which includes the Northern San Joaquin Valley and the Greater Bay and Sacramento Areas. Tracy Mayor, Michael Maciel, will deliver the opening address, which will highlight the City’s accomplishments in 2015, as well as the vision for the Tracy generic accutane us online community. The keynote address will be delivered by Dr. Jeffrey Michael, Director of the Center for Business and Policy Research at the University of the Pacific in Stockton, California. Dr. Michael’s presentation will focus on the current economic landscape of the Northern San Joaquin Valley; Tracy’s position as an economic driver within the region (including its growing ties to the Greater Bay and Sacramento areas), and opportunities for inter-regional collaborations to support social and economic systems.